take another road to another time – . . . like a novel from the five and dime . . .
. . . like a novel from the five and dime . . .
Gene Wolfe died almost a week ago on April 14. 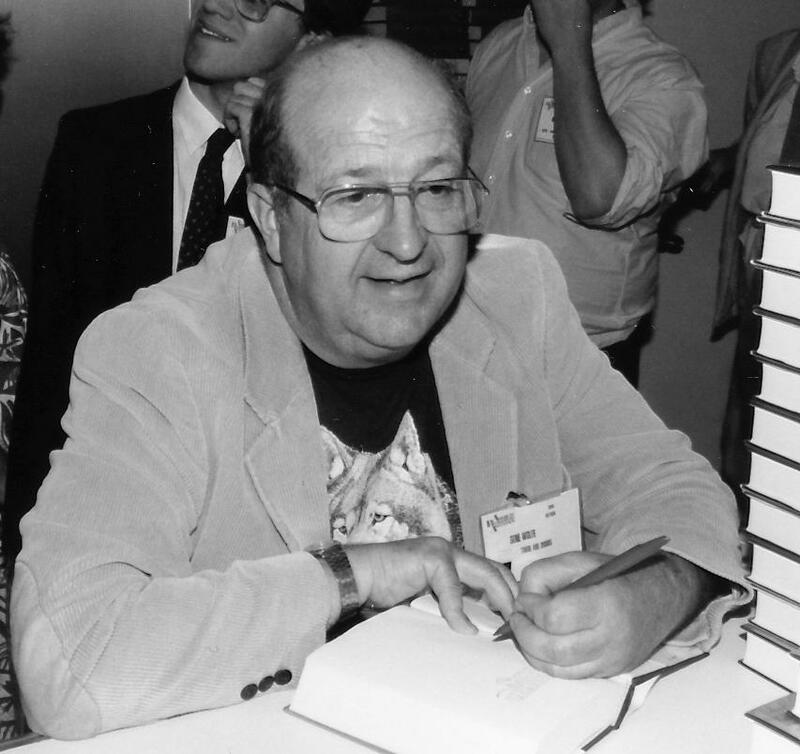 Most of you have never heard of him, but in the cross-genre world of science fiction, fantasy, and Literature with a capital L, his words crossed the boundaries of 1980s gutter genre and became something singular; something magical. Within minutes I knew the characters, where the phrase would be placed, and what would happen in the story. That night, I pounded it out on the portable typewriter I’d brought with me. The Book of the New Sun remains to this day one of the most challenging and rewarding reads I’ve ever experienced. And I desperately wanted Wolfe’s input. Boy, was I grateful. He gave me support that I didn’t know I needed. And his comments echoed my own about what I had written. I knew where the story came from, but I didn’t really know 100% what it was all about. A few months later, I polished it up a little and sent it to Twilight Zone Magazine. They were having a short story contest. I didn’t win, but I got an honorable mention. Not too bad, thanks to Brian Aldiss and Gene Wolfe. That’s my Gene Wolfe story. I never got a chance to meet or talk with him again. But he had an impact on my life, and his books still continue to influence and amaze me. And here are some nice words about Gene from his friend, Neil Gaiman. Read these. The jpgs link to Amazon. We were starving, and suddenly we’d run out of time for a really good meal (Rusty’s American Shepherd’s Pie). So I combined a few things and made an easy spaghetti and meat sauce. But, as my wife told me, the salad dressing, created on the fly, was the star of the meal. Thanks, sweetie! Combine all and stir well at time of serving. Feel free to add more herbs at your liking. Universal . . . Make it So. 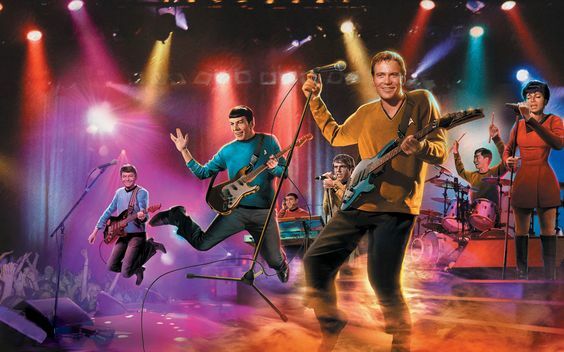 So, the rumor all over the web a few days ago was that Universal is considering building a Star Trek-themed area at their parks in Orlando. 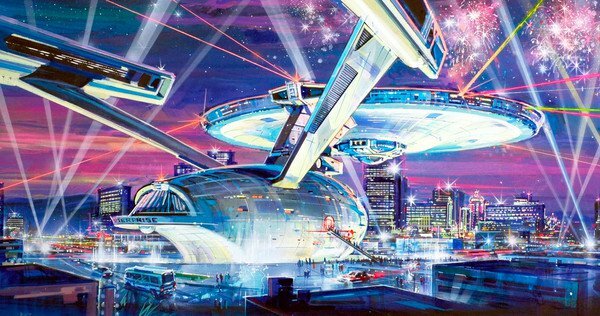 Art from a proposed Las Vegas attraction. I think it’s a no-brainer. BUILD IT . . . AND THEY WILL COME. Disney is milking Star Wars for every cent they can get out of it. Paramount and CBS, who divvied up the Star Trek properties a few years back (Paramount got the movies; CBS got all the TV series), have allowed the franchise to grow stagnant. With the prospect of two new Star Trek films on the horizon (one directed by Quentin Tarantino), the debut of the new Star Trek: Discovery series on TV, and the rumors that Paramount and CBS are in meetings to bring the Star Trek mediaverse back together, Star Trek needs to take command once again. While Star Wars delivers entertainment, the best examples of Star Trek have always offered an optimistic blend of both entertainment and knowledge. We’ll soon be able to live a Star Wars dream at the Disney Parks. I hope that an expansive Star Trek dream at Universal will bring us the wonders of life at the edge of the Final Frontier. Westworld has robots. They attack. The Gaylord Palms is a hotel in Orlando that I’ve thought of staying at during a vacation. I’m no longer sure I care to explore their options. I hear the concierge, with every request, demands a raw hunk of chicken. BETTER THE DAY AFTER COOKING. Instant Mashed Potatoes for 5 (follow instructions on box) or homemade mashed potatoes . . . your call. Make the mashed potatoes and set aside. Sauté vegetables. Melt butter in a large sauté pan on medium heat and add drizzle of olive oil. Add the chopped onions and cook for about 4 minutes. Add some salt and pepper. Add frozen vegetables and sauté mixture about 5-6 minutes without burning onions. Add more salt and pepper. Add the ground beef to the pan with the onions and vegetables. Mix it all together and cook until beef is no longer pink. Add Worcestershire sauce, diced tomatoes and juices, diced potatoes, and broth/au jus. Season with pinches of garlic powder, oregano, and more salt and pepper–ALL TO YOUR TASTE. Bring the pan to a simmer and reduce heat to low. Cook uncovered for 10 minutes to cook off some of the liquids. Layer the meat mixture evenly in a large baking dish, such as an 8” x 8” Pyrex pan or larger. Spread mashed potatoes over the beef and veggies in an even layer. Sprinkle grated sharp cheddar cheese over the top of the mashed potatoes before baking. Bake in oven for half an hour. Rusty recommends Bass Ale, Harp, or a Sangiovese to accompany his pie. Star Wars Starship Hotel – Proposal / Development – (7/11/17) Like everyone, I heard the first rumors of a possible Star Wars themed hotel concept pitched for Walt Disney World and once the initial “Oooohh!” moment passed, I had to scoff at the idea. The cynic in me was pretty sure that nothing like that would ever happen, at least not like what was being shown in the survey’s Disney was quietly showing off to select guests. Yeah… while I don’t think the project has been given the final green light to proceed, apparenly Disney really is developing a Star Wars themed hotel concept that would be built right at the Studios park next to the Star Wars Land itself. Don’t look for anything to happen until they get their new parking lot configuration up and running, but once they are ready to close down the current toll plaza entrance off World Drive in favor of the new park entrance off Osceola Parkway, work could begin on the new hotel concept. So what this really supposed to be? Well, you can see some concept art used for a guest survey posted here, but in the end it may be more simple to explain the basic premise like this… imagine going on a cruise ship… that really goes nowhere at all. The concept is a something of a dream for some designers out there that has never really been built out as far as I know, but some refer to it as a LBC… aka: Land Based Cruise. The hotel would be themed as a giant Star Wars Universe themed starship… an interstellar cruise ship experience… and guests would book a stay for several days, much like they would at a normal WDW hotel, expect you can expect this one to cost much much more. The idea is that while guests would leave the hotel during the daytime to visit the Disney theme parks as normal, they would return to the starship in the evening hours which would offer extra dining, exclusive entertainment, and even special themed excursions and adventures themed to the Star Wars Universe. In short all these bonus adventures are only available to the guests of Star Wars hotel, and unlike the other Walt Disney World Resorts, other guests would not be permitted inside to visit. I’m told that Disney pitched a similar idea several years back, before Disney bought Star Wars, that involved building a similar themed hotel experience that would have been based on the myths and ghoulish legends of the Haunted Mansion, allowing guests to experience something akin to spending the night inside the Haunted Mansion with lots of themed spooky fun events to take place throughout the evening hours. The Star Wars idea is an interesting one, and it would finally give Disney something they’ve been after… an upscale park experience that guests will pay top dollar to experience much like SeaWorld’s Discovery Cove. Except this isn’t just an upscale park experience, this bundles in a whole new resort category into the mix as well. It should be interesting to see if Disney goes through with it or not, and if guests are willing to drop around $1000 per person for a 2-3 day experience. You can see concept art for the possible hotel here; but I’d be much more interested in a Haunted Mansion hotel. It’s more authentic, more Disneyesque, and more adult-oriented. It would be a perfect place to stimulate the imagination . . .
For a time in the dim, distant ’80s, WNOR, FM 98 in Hampton Roads, Virginia, played this exactly at 5:00 pm every Friday. In that spirit, I hope you embrace the power and the deep exhalation of relaxation that is the weekend.